I have to start this post with an apology! I'm so sorry this post is a week late honeys. I haven't been feeling at my best, my bloods are terribly low again and while I have posts lined up, just getting them written & published is proving difficult right now. Maybe not quite time for warm sweaters, mittens and scarves yet but certainly there is a change in the air. Most noticeable in the early morning when Hubby takes Jade for her walk. 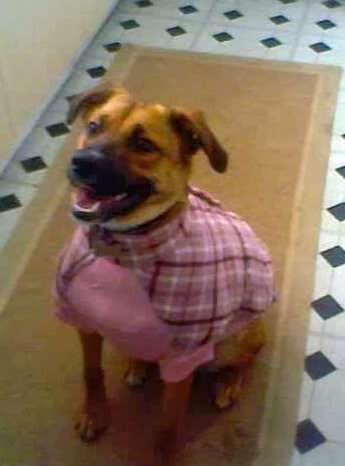 Jade has her jacket on now to keep her warm on walkies. The petals are falling now and soon they'll sleep through winter until spring warmth wakes them again..
Four full days of tearing down old, weather worn fencing, installed by our homes previous owners many years ago and replacing the seven foot tall fence with a lovely, and lower, five foot tall fence. There is still work to do but poor Hubby ran out of holiday bless him. He says he's going to use weekends to finish the fencing off before winter arrives. I'm so proud of him. He constantly amazes me with the work he does around our home. Nothing seems to phase him, even a little :) He once removed the whole sink from our bathroom and then replaced it again as well as fitting pretty new ceramic lever taps.